I did them toe-up, two-at-a-time, with a magic cast-on (Cat Bordhi's video is a great example as well), and a Fleegle heel. You can queue these in Ravelry. Circulars or DPN's in #0 or #1 (I used both sizes to do them two-at-a-time since that's what I had) This is written with using two circulars, so if you use DPN's, then adjust it to how you arrange sts on them. foot length approx 3" (this is customizable), foot circumference approx 3.5"
dd - double decrease, slip two sts together knitwise, then knit the next st, now slip the two slipped sts over the knit st.
sewn bind off - using tapestry needle, thread needle purlwise through next 2 sts on needle, then back through first st knitwise and slip that st off needle, continue until all sts are worked and weave in ends. Begin by casting on 12 sts using the magic cast on. You will have 6 sts on each needle. Now you will be working the pattern on the instep needle, and plain stockinette on the sole needle. Repeat these two rounds 9 times to reach a foot length of 2" or until 1" shorter than desired length of foot. The gusset and heel turn will normally consume about 1" of length so you can adjust your final foot size with that in mind. Work in pattern across instep needle, and then began gusset increases on your sole/heel needle. Working on the sole/heel needle now, k1, inc1, knit to last st, inc1, k1. On instep needle, continue where you are at in the pattern (either a knit row or pattern row). 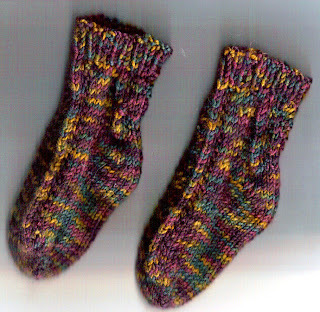 On sole/heel needle, knit all sts. Repeat these two rounds until you have 26 sts on the sole/heel needle (you will have 16 sts on the instep needle still, bringing you to a total of 42 sts between both needles). Now, you are ready to begin turning your heel, which will be worked only on the sole/heel needle. Note where you leave off in pattern to pick it back up (either a knit row or pattern row) after you turn the heel. Place a marker in the middle of the sts on the sole/heel needle. You will have 13 sts on either side of the marker. All work will be done on this needle only for now. Repeat these two rounds until you have ended on a purl round and have two sts left on each side. Now you will sl1 knitwise, and knit until 1 st before the gap, k2tog, k1, and NOT TURN. Continue working now on your instep needle (no gap this way - see Fleegle heel link above for clarification). Continue working in pattern where you left off and work in pattern on both instep and heel/needle so it wraps around the ankle on both sides. Work for 9 complete repeats of pattern (18 rnds) or until desired length. Work in 1x1 ribbing for 6 rnds or until desired length. Bind off using the sewn bind off. More information and pictures can be found here. Any corrections, or questions or whatever, let me know. I'm bound to have missed something due to my pregnant brain. I can't believe there haven't been any comments! How cute are these and how cuter that it's jaywalker. Mom & babe can wear matching socks! They're wonderful! These look lovely! I can't wait to get some new yarn and start making them! Thanks for the pattern!